Indian Motorcycles line Capitol Street in Eagle Wednesday as riders gather at the Dusty Boot Roadhouse for a celebration in honor of the Veterans Charity Ride. EAGLE — The United States is a big place. For a group of veterans on this year’s Veterans Charity Ride, motorcycles provided their first view of some of the country’s most scenic landscapes. The ride, sponsored by Indian Motorcycles and Champion Sidecars, made an overnight stop in Eagle on Wednesday, part of a nine-day trip from Los Angeles to the annual motorcycle rally in Sturgis, South Dakota. The group — which included 20 combat-injured veterans — started on Wednesday in Moab, Utah. That meant a ride from the desert into the mountains, with a full dose of summer heat and a few cooling splashes of rain. The trip from Los Angeles has included a lot of desert riding, including visits to Zion and Bryce Canyon national parks. “We’ve been soaking in every minute,” veteran Neil Frustaglio said. After riding through a big part of the American Southwest, Josh Stein said he hopes to come back soon. Frustaglio and Stein hail from Texas, around San Antonio. The two have custom Harley-Davidson trikes at home. But, since Indian is the sponsor of the Veterans Charity Ride, the two paired up in a customized sidecar rig built from an Indian Scout and a Champion sidecar. That rig, along with a couple of others on the ride, is equipped with hand controls. Combat cost Frustaglio and Stein both of their legs. So the pair took turns riding the bike and riding in the sidecar. Motorcycling is a big part of post-service life for many veterans. 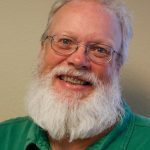 Stein and Frustaglio, along with other veterans, were already a tight-knit group by the time they hit the Colorado-Utah border. There’s a lot of good-natured ribbing between the vets, who served mostly in the U.S. Army and U.S. Marines. Those services have a long history of giving each other grief. But, Stein said, heaven help any outsider who tries to disrupt the group. “We have each other’s backs,” he said. The riders stopped in New Castle on Wednesday afternoon for a rest break and a short ceremony at the town’s memorial to Will “Pyro” Duboise, who was killed in combat several years ago. From there is was off to Eagle, with a number of local riders joining the group. Anne Ralston of Eagle said the afternoon ride was a “good excuse to get on the bike” on a weekday afternoon. But, more seriously, she said she wanted to participate, too. Ultimately, a line of motorcycles sometimes stretching out a mile on Interstate 70 headed toward Eagle County through Glenwood Canyon. The group left the interstate at Gypsum to ride U.S. Highway 6 to its ultimate destination at the Dusty Boot. As the group passed through town, fire trucks and firefighters waved. Gypsum Mayor Steve Carver, a former Marine, stood at attention and saluted as the riders passed by. At Eagle, local riders might have been a little confused when the group didn’t head toward Eagle Ranch on Sylvan Lake Road. Instead, the group headed toward Broadway, Eagle’s main street. There, a group outside of town hall waved small flags as the group passed by. Another group of flag-wavers gathered outside the Eagle County Administration building. Town of Eagle events coordinator Jeremy Gross and Eagle County Veterans Affairs Coordinator Pat Hammon made sure there were flag-wavers to greet the riders. 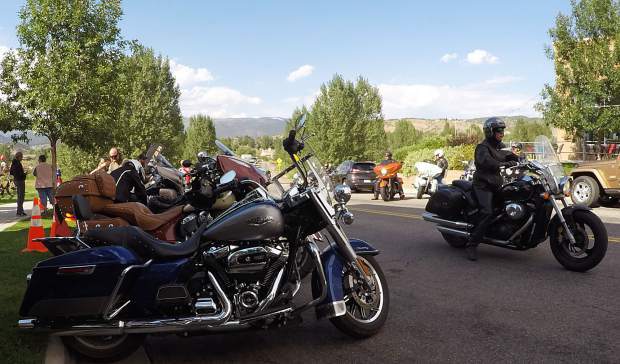 The group dismounted at the Dusty Boot, greeted with a celebration at the restaurant, and greeted by other riders who came up from the Front Range to spend the night, then head toward Denver on Thursday morning. Many were veterans, their vests and jackets proclaiming membership in either the American Legion or the Veterans of Foreign Wars. The Veterans Charity Ride was the first visit to Colorado for many of the group, including Robert Pinkham, a veteran of the army’s 10th Mountain Division. That division is today stationed at Fort Drum, New York, but originated in the mountains between Red Cliff and Tennessee Pass at Camp Hale. “It’s really heartwarming having these small towns support us,” Pinkham said. That support can be humbling for those who provide it, especially since few Americans these days serve in the military. Veterans are happy for the support. But, Stein said, their American experience is a lot different from that of civilians. Stein’s family is filled with veterans, and his father remains on active duty in the Army.